Inverness Canada provides the safest, most technologically modern cartilage piercing equipment on the market today. The Inverness 2000 system has a patented safety clutch (no butterfly clasp) which protects the client at home from accidentally over-tightening the earring to the ear. It is a hand-pressured instrument which allows for piercing accuracy. The thin, ultra sharp piercing post greatly reduces piercing sensation and is gentle on cartilage piercing. The Inverness 2000 system is completely sterilized at an accredited FDA facility in the United States, plus all piercing metals uses are hypoallergenic and also manufactured in the US. The piercing studs are 100% encapsulated (virtually eliminating the chance of any ear piercing infection) and have a “Class 1" medical device designation. In addition, I provide detailed instructions as to ear piercing aftercare to ensure that you minimize any chance of infection. Ear Piercing: Ranging from $27-$45, you pay for the choice of earrings. than 24 hours without earrings or the holes could begin to close. CLEANSE: ear lobe and earring twice a day using a clean cotton swab, soaking both sides of the ear with Inverness Ear Care Antiseptic. TURN: earrings twice a day. Always cleanse hands thoroughly before touching your ear/earrings. remove the earring without immediately replacing or the hole could begin to close. CLEANSE: the ear and earring twice a day using a clean cotton swab, soaking both sides of the ear with Inverness Ear Care Antiseptic. Please be aware that bacteria grows more easily behind the ears, especially during the summer months when we're more likely to perspire. Swimming and other activities which involve contact with water that may be contaminated also pose a risk to infection. For those with an active lifestyle, should clean piercings more than twice a day. How many ears have been pierced with the Inverness Systems? 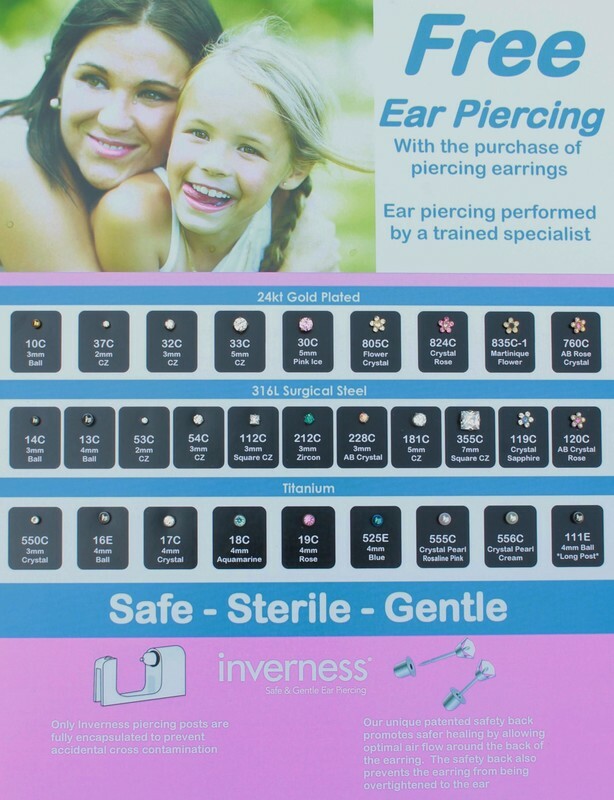 The Inverness Ear Piercing System is used worldwide and has gently pierced over 300 million pair of ears. Associates are thoroughly trained in the Inverness ear piercing procedure. Is ear piercing with the Inverness system safe? YES! The Inverness Ear Piercing System is 100% safe. The earrings are sterilized and stored in capsules, not even the point of the earring is exposed until it is safely inserted into the ear. All Inverness piercing earrings are either Nickel-free or hypo-allergenic, which significantly reduces the risk of allergic reaction. The Inverness Ear Piercing System is fast and very gentle. Most people feel no discomfort during the piercing. Will I be able to leave the earrings out without the hole closing? Some people assume earrings can be removed and easily re-inserted; this is not the case. You should only switch into new earrings after the healing period, which is 6 weeks for an earlobe piercing and 12 weeks for a cartilage piercing. Is it safe to pierce infants and children? YES. Inverness does recommend, however, that babies have a current D.P.T. shot. This first D.P.T. shot is usually administered by a pediatrician at 6 weeks of age. No, absolutely not. The Inverness Ear Piercing System is designed to safely pierce only the earlobe and the outer cartilage portion of the ear. The system should never be used to pierce any other body parts. Inverness recommends that the piercing earrings are left in for 6 weeks after an earlobe piercing and 12 weeks for cartilage. How is the cartilage different from the earlobe? Cartilage is the translucent, elastic tissue located in the upper portion of the ear. Think of the cartilage area as two separate sections - the skin covering the cartilage and the cartilage itself. Cartilage differs from the earlobe primarily in that it has a limited blood supply. How old do you have to be to have your ears pierced? Anyone under the age of 16 needs to have parental consent (signing the form). I need to see some form of ID from anyone that looks around the age of 17 prior to piercing. 29 earring styles to chose from. Case that each pair of earrings comes in, completely sealed and sterilized.